Being able to correctly and efficiently use an array of knives is one of the most essential cooking skills you need to learn to become a professional chef. Knife skills are one of the first things taught at culinary school, and the more you master your cutlery techniques, the more precise and efficient you will be in the kitchen. That being said, knife skills are key to becoming the best chef in the business. But, to step up your knife skill game and perfect your techniques, all chefs should ensure that you have the right tools at your disposal. Making sure you have a wide variety of sharp, quality knives is the difference between success and failure in the kitchen. Here are some blades we believe every chef should have in your arsenal. Top of our list is the chef’s knife, which is one of the most versatile blades a chef can own. This knife can be used for a host of cutting jobs, from chopping vegetables to slicing meat. These blades come in a range of sizes, from six to 12 inches, although the most common length is eight inches. This knife has been designed to be light and effective, making it a good choice for starter cooks and experts alike. The relatively long blade of the knife offers leverage, making it perfect for chef’s with smaller hands, although it is advised to check the weight and grip on a few options before purchasing a chef’s knife. Ideally, you should pick a knife that feels natural in your hands. Like the chef’s knife, the paring knife is a must-have in the kitchen. The paring knife is ideal for work on smaller items as it features a blade of typically 3.5 inches. These knives are used for more detailed work as you can control the blade easier. Also, this blade is good for slicing and mincing, although it should only be used on smaller items and not hard vegetables and meats. 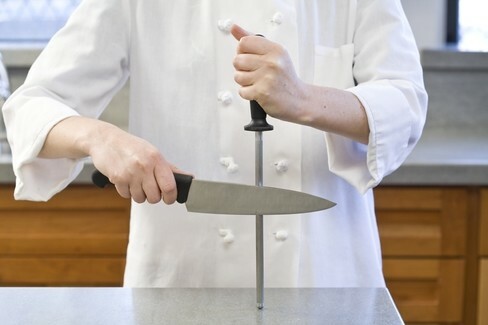 As a general rule of thumb, you should not have to apply too much force or pressure to the blade of your paring knife. Not only will this result in a bad or uneven cut, but it can also cause injury. The bread knife is a common knife in every kitchen. It features a serrated blade and is usually associated with bread as its saw-like features are adept at cutting through thick crust and keeping slices from breaking. That being said, the serrations also work well for fruits and vegetables with smooth, waxy surfaces like watermelons, citrus, tomatoes, and peppers as they offer better grip. Serrated blades are also able to perform better with a dull blade when compared to straight ones, although they are generally more difficult to sharpen. A boning knife features a thin, extra sharp blade of about five to six inches long. These knives are designed to help you efficiently remove bones and skin and are generally available in two major varieties. A boning knife with a more flexible blade is ideal for poultry and fish, while the knife with a stiff blade is better for thicker meats like beef and pork. While utility knives may not be as prominent in modern kitchens as they once were, it is still an essential knife to have in your kit. The kitchen utility knife provides an option between the chef’s knife and paring knife. It has a thinner blade than a chef’s knife and is usually about six inches thick. This knife is ideal for fruit, but can also be used for cutting meat and preparing sandwiches. Carving knives are probably most prominent around Christmas time in households, while they are consistently used in a professional kitchen. Featuring long blades of up to 15 inches, carvers are used to cut thin slices of meat. These knives can prove invaluable and makes carving a breeze, whether it is lamb, turkey, chicken, ham or beef. There you have it – some of the most important and valuable knives a professional chef should own. Chef Works offers a range of high-quality chef knives for your every use in the kitchen at the most reasonable prices. Visit the site today and find the best knives for your kitchen.